Ray: "I have no idea what happened"
(CNN) -- A self-help expert said Tuesday that he has hired his own investigators to determine what happened at his Arizona retreat last week, when two people died after spending considerable time in a sweat lodge. 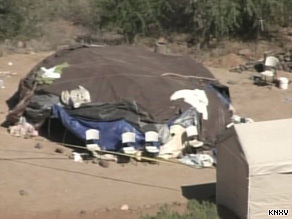 Self-help author James Arthur Ray has hired investigators to investigate two deaths at an Arizona sweat lodge. Tuesday's tearful speech before about 200 supporters was the first time that best-selling self-help author James Arthur Ray had publicly discussed the case. Authorities said James Shore of Milwaukee, Wisconsin, and Kirby Brown of Westtown, New York, died Friday at the Angel Valley Resort after spending up to two hours in the sauna-like sweat lodge. Nineteen others were treated for injuries. "I have no idea what happened. We'll figure it out," Ray said, adding that he had hired investigators. "I've lost people I love and really care about." Police are also investigating the incident at the central Arizona resort, located in a secluded valley 20 minutes from Sedona. Ray is the author of the best-selling book "Harmonic Wealth: The Secret of Attracting the Life You Want." Ray, described on his Web site as a "personal success strategist," has appeared on CNN's "Larry King Live" and the "Oprah Winfrey Show," and is featured in the self-empowerment film "The Secret." On Tuesday, Ray told the crowd that he is struggling with the deaths. "These are challenging times," he said. "I've faced many; none like this. I don't know how to deal with it really." CNN's Sara Weisfeldt contributed to this report.